Happy weekend everyone one! here in the USA it's a LONG weekend - celebrating Columbus Day on Monday - whoo hoo!! 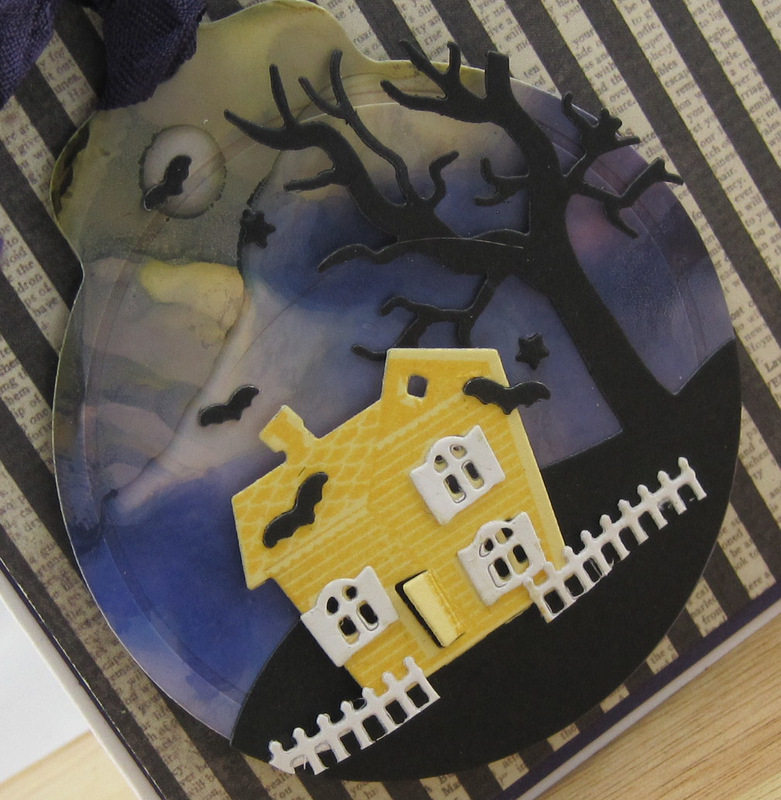 I have a tag card to share today and I used my Petite Places Spook Manor dies and stamps from PTI for the first time! I love this Tag Sale #4 die from PTI, it's like a little ornament! I inked the background on it using a technique I learned at at Wendy Vecchi class (see her Youtube video here) - I put some drops of WV Archival reinkers (Violet, Pink and Buttercup) on my craft mat then splashed on some Rubbing Alcohol and mixed it with a pallet knife. Then I dragged a panel of Ranger Specialty paper through the mix - adding more drips and more rubbing alcohol to the panel until I got the color mix and design I was happy with. I dried the panel with my heat tool and then cut it with the tag die. The house, window frames, fences and bats are dies from Petite Places Spook Manor. The tiny stars, tree and landscape are Scene It Hallows Eve dies. 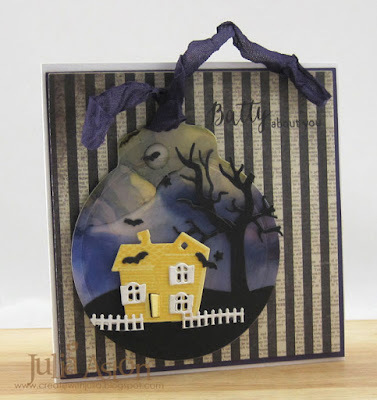 The fun sentiment is from Peek A Boo Sentiments by Waltzingmouse. 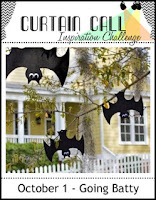 This is so fabulous...love your sweet batty scene! 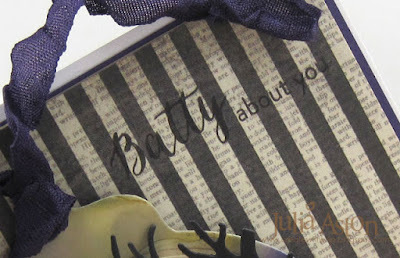 Such a fun card Julia! Love the scene you created! All the bats look fabulous! 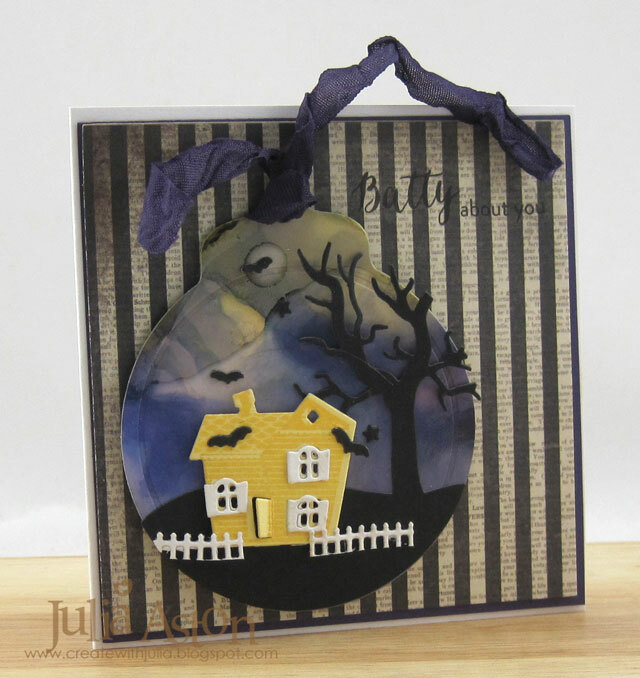 What a cool, spooky Halloween scene! Such a cute batty bauble - a really fun make.